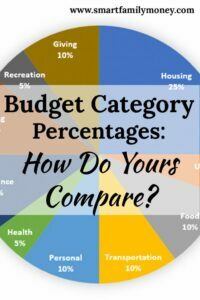 Budget Category Percentages: How Do Yours Compare? Since few people talk about money, it can be hard to know where you stand compared to others. 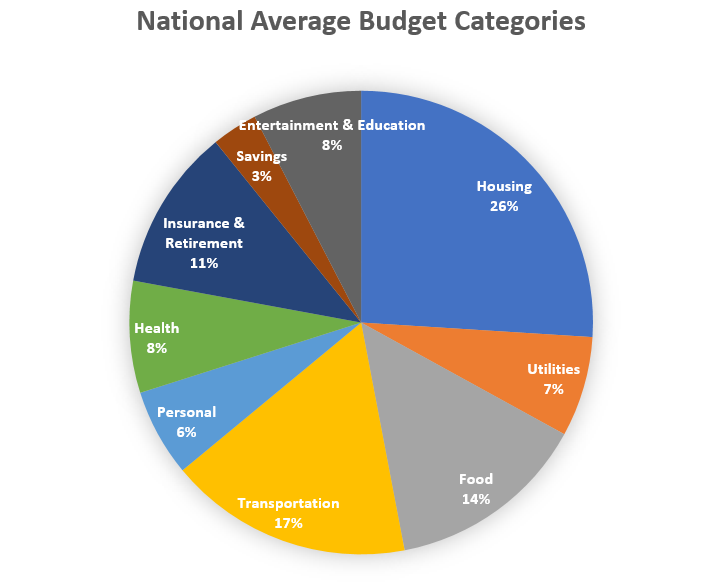 This post will take a look at some recommended budget category percentages and average spending in the United States. What Should My Budget Category Percentages Be? Let’s start by taking a look at what personal finance guru Dave Ramsey has to say on this topic. If you’re not familiar with him, he’s most famous for his book The Total Money Makeover and his Financial Peace University classes. The food and transportation percentages are close to the upper end of Dave Ramsey’s ranges, but the whole pie still needs to add up to 100%. If you’re maxing out your food and transportation, you need to cut back somewhere (and often it’s savings that get cut). Having talked to many people about their budgets, these charts make a lot of sense to me. 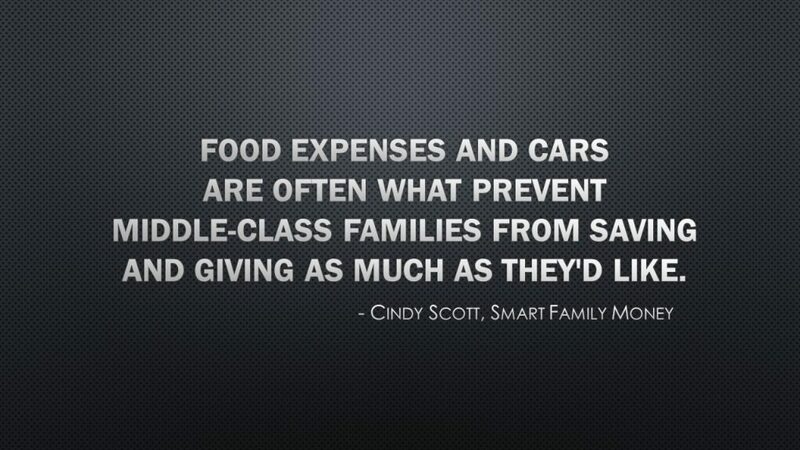 Food expenses and cars are often what keep middle-class families from saving and giving as much as they’d like. Housing expenses can also be the problem, especially in high cost of living areas. 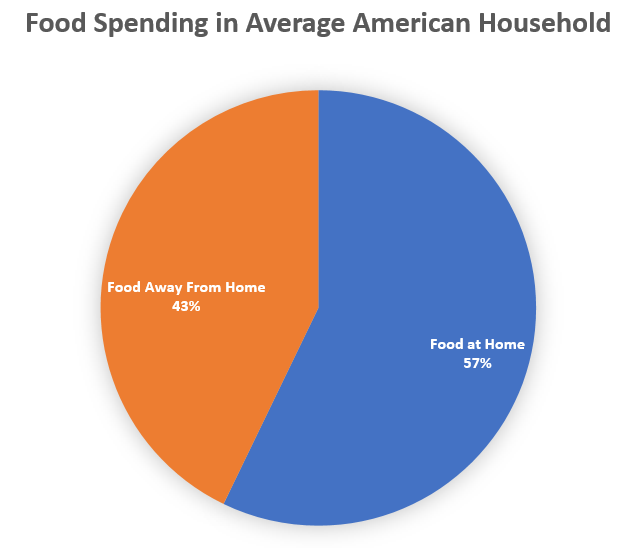 If you look a little closer at the numbers from the BLS, you’ll see the average family owned 1.9 cars and spent 43% of their food budget on restaurants. For those looking to change their budgets, this area definitely needs a closer look. 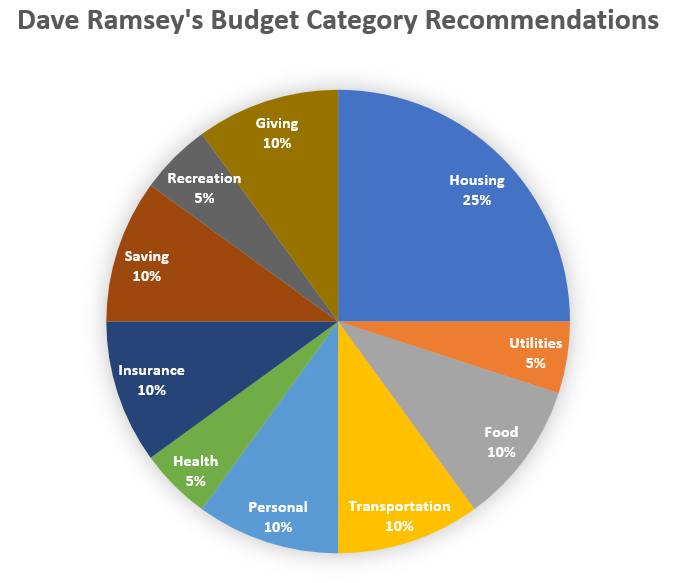 Dave Ramsey’s budget category percentages are very specific and might not fit your personal values and goals. 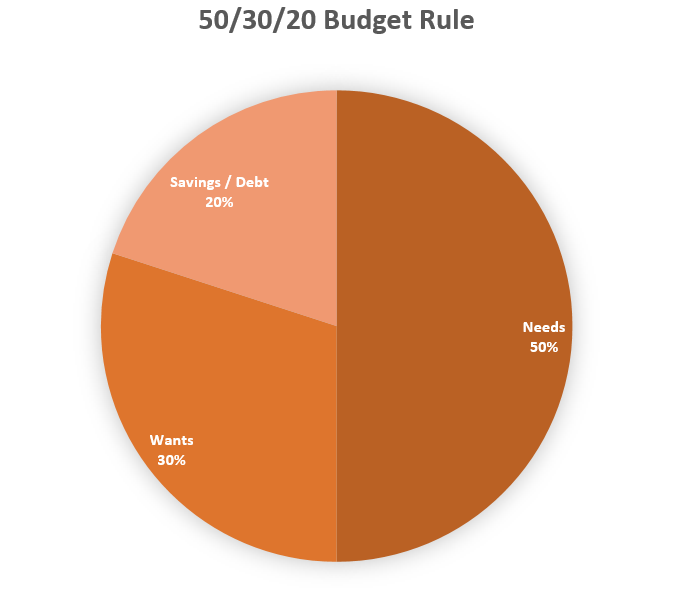 Another popular budget category percentage recommendation is the 50/30/20 rule. It has been discussed by a number of personal finance experts but was made popular by Senator Elizabeth Warren in her book All Your Worth: The Ultimate Money Plan. In theory, I love this concept! In reality, it’s pretty tricky. Needs are things that you can’t survive without, like housing, food, basic clothing, and transportation to work. Wants are anything that is optional in your life and done for the fun of it. This would include entertainment, vacations, gifts, and so on. What Is Savings and Debt Payoff? If you’re in debt, extra payments towards payoff would count in this category. Any type of savings also fits here. While these categories may seem clear, they’re actually so vague that it’s really hard to use. Is my clothing budget a need or a want? Well, obviously, we need to be clothed, but everyone in my house has enough clothing to keep their body covered… so is all the rest a want? What about food? And transportation? Is a new Mercedes a need or a want? It does get you to work! If these things exceed 50% of your take-home income, you’re likely to feel very crunched and unlikely to make much headway on savings or paying off debt. A criticism I’ve often heard of all of these budget category percentages is that they don’t include childcare. For many families, the cost of childcare can match their housing payment. If it’s one of the biggest expenses, why is it not included? Childcare expenses are large, but they’re only incurred by a small number of families. Only about 18% of US household have children under age 6 and not even all of those would have childcare expenses. I think many financial experts consider childcare a cost of working. Since these categories are generally for take-home pay, I think it’s expected that childcare expenses would be subtracted to calculate take-home pay. For the purposes of examining your budget category percentages, I would subtract childcare expenses from your income before looking at your budget. Alternately, using the 50/30/20 rule, you could include childcare in your 50% needs calculation. What Do You Do if Your Budget Doesn’t Match the Ideal? Decrease your spending by reducing shopping, eating out, vacations, and so on. Spending too much on needs is the more common problem. How is that possible to overspend on needs? Well, we all need a house and basic transportation, but there’s a HUGE range of costs for those things. The problem is that correcting these kinds of budget problems mean big life changes. You have two options. Decrease spending on needs by moving to a less expensive home or getting rid of cars. Option 1 is not always very feasible. If it is possible, it can be a very difficult thing to get the whole family on board. I personally did make these kinds of changes when we first started paying off our debt. We realized that our budget wasn’t working, so we sold both of our expensive cars and replaced them with two clunkers. It made a huge difference in our budget, even if our families thought we had lost our minds! While option 2 might sound too difficult, the truth is that your income will likely increase over time, especially if you’re still early in your career. If you manage to not increase your standard of living, your budget percentages will gradually improve. This happened to us as my husband got raises and promotions over the years. If you’d like to increase income faster, you can add more income through extra work. Decrease spending on your wants. Decrease spending on your needs. Reduced our food spending by eating out less often, cooking from scratch more, and switching to grocery shopping at Aldi. Reduced our car expenses by selling both of our expensive cars, eliminating our car loans, and switching to paid-for clunker cars. Increased our debt payoff and savings amounts with the money that was freed up. Kept our housing costs steady, even as our income gradually increased. Slowly our house payment became a smaller percentage of our income. Are you fitting the ideal budget category percentages? What areas do you need to increase or decrease?